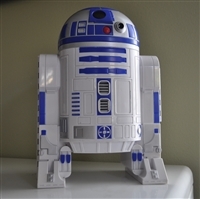 Home > Toys and Collectibles > Star Wars toys, games, etc. STAR WARS BLACK SERIES TITANIUM SERIES IMPERIAL DEATH TROOPER & REBEL COMMANDO, 2015. Dart Vader plush toy from Lucasfilms 2010, 12" tall. Action Fleet 1996, Ice planet HOTH unfolding base. 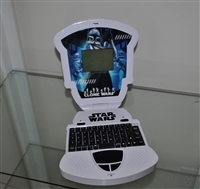 Star Wars working,learning laptop/game from Oregon Scientific. Star Wars 2011 Stormtrooper blaster, Hasbro. No darts. R2D2 hard plastic large toy cars storage from 1998. Star Wars 1996 Stormtrooper blaster, light and sound. VIntage satin brass color cast metal huge Bear Money Bank, Piggy Bank. Star Wars Darth Vader bobble head Galaxy Best Father display. STAR WARS TRIVIA PURSUIT board game, 1998 collector's edition.